For over 25 years Cow Sense® continues to supply computerized cow herd record keeping tools to the beef industry. Having launched the first Microsoft Windows compatible cow herd management product on the market, we continue that pioneering leadership today. Cow Sense NxGen gives YOU the tools to turn “Systems Thinking” into practical application! With Cow Sense NxGen we have consolidated the features available in previous versions. The Cow Sense NxGen offering consists of just two core products EZ and PRO. Each version offers features from which you can pick and choose based upon the level of detail you want your herd records to provide. In addition, herd size and the number of herds you wish to maintain will be a consideration. 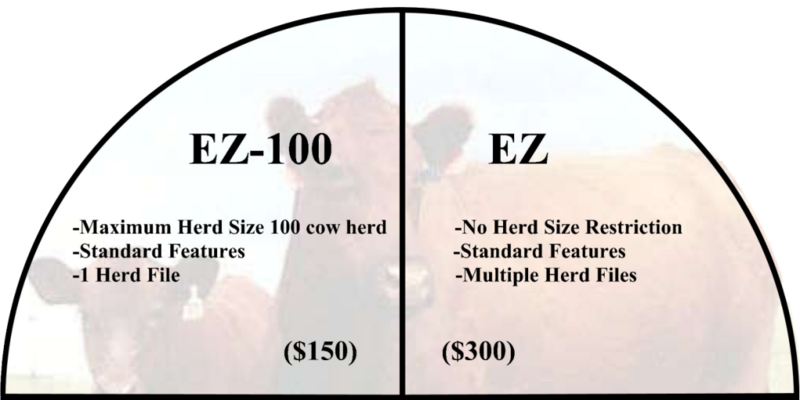 EZ-100 and PRO-100 are designed for operations that have 100 head or less of active breeding cows in the herd and 1 herd file. There is no limit to herd size or number of herd files with either the standard EZ or PRO products. Ready to Buy the Best Herd Management Software Available? Click on the version of NxGen below that best suites your needs.. Still not sure what you need or want more information? Call us Toll Free at 1-800-584-0040 or Email us at sales@cowsense.com. We will be happy to answer any questions you have and discuss what programs will be best for your company and how you operate your business.